Unique, one of a kind World Traveler Vampire Hunter Kit was made with a glossy-finished box. CRYSTOBAL continually searches for new and fun ways to theme his vampire killing kits. 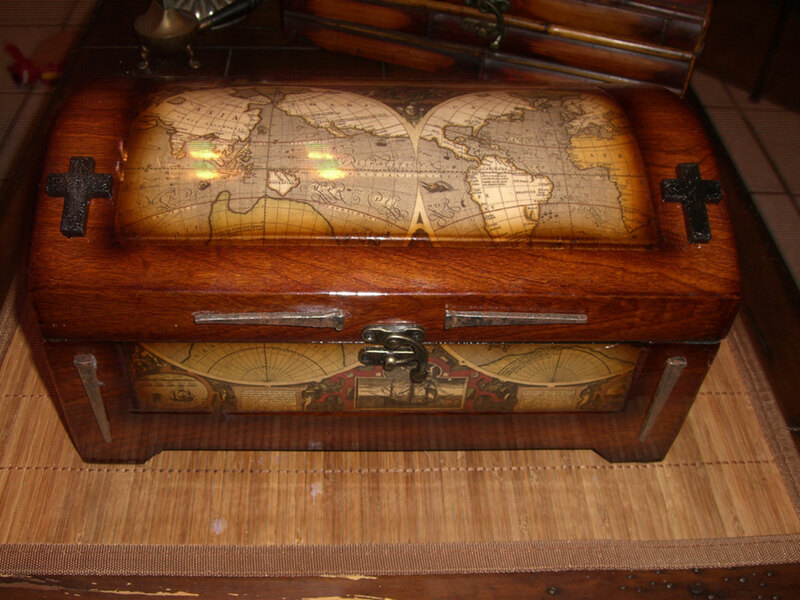 When he came upon this glossy-finished wooden box with vintage maps of the world decor, he instantly got the idea for a World Traveler Vampire Hunter Kit. Sometimes inspiration comes from strange places The minute CRYSTOBAL saw this box, he formulated the concept of the World Traveler Vampire Hunter Kit. This kit would be used at the turn of the century, by professional hunters and travelers of means, who would keep this kit in a steamer trunk. It would then be ready to go off on a journey at a moment’s notice. 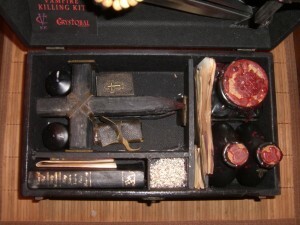 The World Traveler Vampire Hunter Kit utilizes the basics of the CRYSTOBAL Vampire Killing Kit: Cross Stakes, a dagger, a hand made rosary, silver chain, rock salt, holy water, candles, matches bound in a leather box, a mirror, coffin nails, consecrated earth, a holy bible, several maps of different countries, and The Characteristics of the Vampire pamphlet. This kit is unique in that it is one of the few kits CRYSTOBAL has made that is not portable in itself. Meaning, it is not a “suitcase” style box, and has no handles. It is made to rest and display on a table, and would be “packed” along with other weapons and supplies. It would then be set up at camp or the traveler’s hotel, open and ready for action. CRYSTOBAL has been creating vampire killing kits for decades. His first kits were made for friends and local theater troupes. He later did work for antique dealers, dark rides, and private collectors. The kits featured on this website are mainly the kits he created for sale to the general public between 1968 and the present.